The Ninja is a fast, hard hitter that can turn their enemies into healing items. Unmatched in strength growth, a ninja can be a hard hitter for the entire game. For all of the strength a ninja gains, they eventually lose pace with soldiers and merchants in attack power due to their main weapon type (gloves) not adding attack power on its own. The Ninja can equip cloth armors and glove weapons. Glove weapons are unique in that they all have an added status ability that has a chance to activate when a ninja attacks, and that they have no attack power on their own. Gloves can have a chance to inflict poison, curse, sleep, slow, confuse, soften or kill (instantly kills non-boss/player targets). Confuse and kill are currently restricted to unique gloves (Delicate Ninja Glove for confuse, Malevolent Gauntlet for kill). Gain an experience level, which grants one point. Progress through the plot of the game, which grants one point after completing the main quest connected to Verity's lighthouse and an additional point after completing the main quest connected to the Arctic's ice palace. As of v1.68 this allows for a maximum of 30 points to spend. 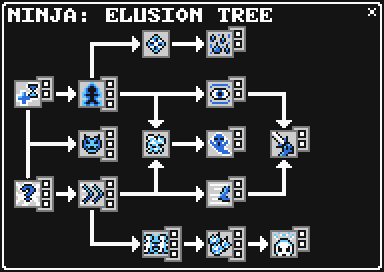 Abilities are skills that the player can use both inside and outside of battle. 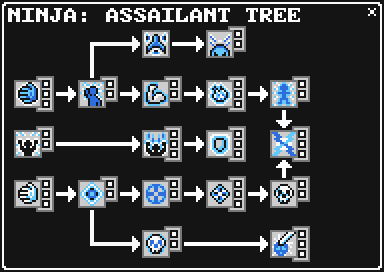 These abilities will either be bought on the skill tree using skill points or will be learned automatically once the player hits a certain level. Vanish 2 1 Overworld invisibility; In battle, the ninja vanishes (increased evasion rate; first strike) and damages a single target. JumpKick 3 3 Power up for one round then deals normal damage and stuns a single target. Evade 3 4 Absorb all targeted attacks on an ally; increases Bonus Dodge. Essence 4 5 Damages a single target and creates a healing item if the target dies. Healing items can not be created from bosses, mini-bosses or players. Decoy 12 8 Deploys dummy targets to draw attention away from one ally. Shuriken 7 10 Inflicts minor physical damage to an enemy group with a chance to poison. Pilfer 6 12 35% base chance to steal an item from the target's inventory. Kamikaze 30 15 Kills the ninja and deals physical damage based on the difference between their HP at time of death and their max HP. The greater the difference, the greater the damage. 5-Point 20 25 Deals major damage to a single target after a 5 round countdown. MagicKick 10 10 Inflicts direct damage based on element set by the caster's top Plus Element stat. NinjaNet 9 10 Causes the slow status on an enemy group. SmokeBomb 12 10 Allies are Vanished and attack first; lasts one round. This page was last edited on 21 August 2017, at 16:34.